Do cereal companies value profits over children's health? Although the Walt Disney Co. recently announced that it would stop running junk food ads during its programming, there's still a heaping bowl of commercials advertising unhealthy snacks to the younger viewing audience. Whether it be the perpetual candy commercials during kids' programming, or ads upon ads of sugary drinks being advertised, children are extremely tempted by the foods they see on TV. Among the biggest marketing campaigns towards children food products is cereal. Obviously not the bran, oat, or corn flakes varieties, but those pre-sweetened cereals like, Cocoa Puffs, Froot Loops, or Honey Smacks. In a new report, the Yale Rudd Center For Food Policy & Obesity revealed that cereal companies marketed the least nutritious products to children while promoting healthier ones to parents. The report indicates that out of 115 brands of cereals examined, 19 were advertised to children, compared to 27 that were marketed to parents as good food choices for their kids. The cereals that were promoted to children, had 85 percent more sugar, 65 percent less fiber, and 60 percent more sodium, according to the report. Like most TV ads made for children, cereal commercials contain bright images, quirky music and animated mascots. Although cereal companies are fully aware of the growing childhood obesity problem, they choose to support the bottom line and put dollars over health, the report charges. General Mills, Kellogg's, and Post spend an average of $156 million per year in marketing children's cereals. The report entitled "Cereal Facts, Food Advertising to Children and Teens Score 2012," also shows that children aged six to 11 watched a whopping 721 cereal commercials on television in 2008, and two to five year olds saw 642. 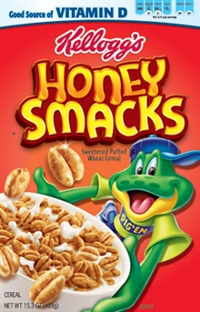 Cereal companies also do a large amount of website advertising, as they know today's children are more computer-savvy than adults. The companies also know kids love video games, so many sites including AppleJacks.com, RessesPuffs.com, and CornPops.com all have interactive games on its site to not only attract younger consumers, but also to get them to return to the site for games, while being kept abreast of new product information. And it's working. As far as how many boxes of sugary cereals were sold to parents and children in 2011, Kellogg's Froot Loops made $162,182,800, Kellogg's Frosted Flakes made $267,170,500 in profit, and General Mills Honey Nut Cheerios pulled in $357,013,600 last year. Talk about a lot of sugar being passed on to children, sheesh! In 2008, when researchers last studied cereal companies and their efforts to target children, preschoolers were exposed to an average of 635 cereal ads in that one year, which breaks down to 1.7 cereal commercials per day. And if kids weren't being sucked in by television commercials, they were on the internet visiting cereal websites. Millsberry.com had the most hits getting 387,000 children to use its site each month. The usual time frame that kids spend on these kind of sites are averaged at 24-minutes per child. Many cereal companies have felt outside pressure from health groups, and a 2006 version of this same FACTS report, also forced companies to take another look at its child marketing tactics. In addition, The Children's Food and Beverage Advertising Initiative (CFBAI), who is sponsored by the Council of Better Business Bureaus, also asked cereal companies to rethink not only its marketing campaigns, but also to reduce some of the sugar in its cereals. In 2009 the Post company joined the CFBAI. Reports by the watch group indicate that General Mills, Kellogg's, and Post have all made attempts to increase marketing healthier cereals towards children. Although cereal companies still have a long way to go, there have been some improvements in the last few years. Between 2009 and 2012, cereal companies have made efforts to improve its nutrition in many children's cereals. Brands that were advertised to the 13 to 16 year old demographic improved from a nutritional score of 40 out of 100 in 2009, to 43 in 2012, according to the report. Additionally, out of the 22 cereal brands that are promoted towards children, 45 percent of the companies lowered the sodium levels between 2008 and 2011, 32 percent reduced levels of sugar, and 23 percent increased the amount of fiber in its children's cereals. The amount of TV ads were also lowered between 2008 and 2011, after cereal companies received increased outside pressure. For preschoolers the amount of commercials for all kinds of cereal dropped by 6 percent, and ads for children type of cereals was lowered by 8 percent. Commercials targeted to children six to 11 were also lowered in the past three years or so. Although some cereal companies have made strides in changing its advertising methods, some companies still promote a heavy amount of its least nutritious cereals to kids. 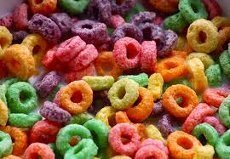 Kellogg's Froot Loops, General Mills Reese's Puffs, Trix, and Post Pebbles have all increased its advertising of unhealthy cereals to children. One of the worse parts of sugary cereals being advertised to children, is the role it plays on kids potentially having sugar dependency as they grow older. According to statistics by the American Diabetes Association, 25.6 million people age 20 or over have diabetes, and many believe sugar addiction starts at a very young age. In 2008, a group of researchers suggested that sugar affects opiods and dopamine in the brain, making the sweet additive very hard to stop using once a person is accustomed to having it. Health experts say that sugar shouldn't make up more than 10 percent of a persons diet. Experts also say to properly wean a child or adult of sugar, one must do their best to stop cold turkey. Sugar is so tasty and potentially addictive, trying to simply lower the amount without stopping completely will be too difficult. It's Similar to how an alcoholic or drug addict can't just lower their used amount and be okay, they must quit entirely. If going cold turkey sounds to daunting one should replace sugary cereals and other snacks with items that contain natural sugars like fruit or the sweet herb Stevia. Experts warn not to use too much of these replacements, as they can also be harmful due to over consumption. It takes the average persons three to seven days to wean themselves off sugar physically, but the mental chains may take much longer to break. As far as lowering your child's dependency on sugar, parents should not only stop purchasing pre-sweetened cereals, but also should monitor the amount of television commercials and websites your child views. This will not only lessen the exposure of unhealthy foods for your children, but it will also lessen the exposure of other unhealthy images and ad campaigns that truly serve no benefit for them. The full report on sugary cereal advertising can be seen here.